Hilda I. Zananiri, 70, of Lowell, a member of a well-known Greater Lowell family, passed away Friday afternoon May 25, 2018, peacefully at the Lahey Clinic in Burlington surrounded by her loving family. Born in Jerusalem, November 3, 1947, a daughter of the late Nahil I. (Ansara) Zananiri, who had died earlier the same day on Friday May 25, 2018 and the late Abraham E. Zananiri, she received her early education at the Nazareth Catholic High School in Amman, Jordan. In 1967, Hilda, her parents and siblings immigrated to the United States from Amman, Jordan, eventually relocating to Lowell, Massachusetts. Once in the United States, she continued her education attaining her Associates Degree in Business at the Chandler School of Business in Boston. Currently, Hilda was a medical interpreter for the Lowell Community Health Center and Lowell General Hospital. 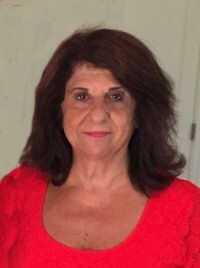 Previously, she was a travel agent for Garber Travel Agency in Andover for many years and began her career as an accounts payable coordinator for the City of Lowell Department of Public Works. Hilda was a proud and longtime member of St. George Antiochian Orthodox Church in Lowell. She was a devoted parishioner who served as President of the Parish Council as well as the Ladies Society. Her greatest joy was organizing the church’s annual Cocktail Raffle fundraiser as well as the church’s participation in the Lowell Folk Festival. Hilda also loved being with her family, traveling, gardening and cooking. She especially loved to plan parties and special events for her loving family and friends. Hilda is survived by four sisters, Nadia Hassey and her husband Donald, Henrietta Zananiri and Rema Lichtenstein and her husband Michael all of Dracut, Rhonda Murray and her husband Gregory of Tyngsboro; three brothers, Elias Zananiri and his wife Martha Nelson of York Beach, ME, William Zananiri and his wife Gina of South Berwick, ME and Nabeel Zananiri and Victoria Gatsas of York Beach, ME; nine nieces and nephews, Sherine Halligan and her husband David, Jennifer Lowe and her husband Matthew, Eric Hassey and his wife Rona, Shaun and Arielle Lichtenstein, Danielle and Michelle Zananiri and Ryan and Tyler Murray; four great nieces and nephews, Brennan and Emerson Halligan and Eva and Matthew Lowe; and four godchildren, Shaun Lichtenstein, Ryan Murray, Samuel Bahou and Nuha Louh. Hilda was also the sister of the late Henry Zananiri. Friends may call at ST. GEORGE ANTIOCHIAN ORTHODOX CHURCH 44 BOWERS ST. in Lowell from 4 to 8 P.M. Thursday. Her Funeral and her mother Nahil’s Funeral will take place Friday morning at 10 o’clock at the Church followed by their burials at the Westlawn Cemetery. E-condolences/directions at www.odonnellfuneralhome.com. Those wishing may make contributions in her memory to St. George Antiochian Orthodox Church, 44 Bowers St., Lowell, MA 01854. Arrangements by the O’DONNELL FUNERAL HOME (978) – 458-8768.